GOMA, Democratic Republic of Congo – Following a wave of defections from the Congolese army last week led by rebel leader-turned-commander Bosco Ntaganda, President Joseph Kabila has countered with a show-of-force of his own. Kabila traveled to the capital cities of Goma and Bukavu early this week to meet with high-level military commanders and announced the suspension of the three-year long Amani Leo operations mainly targeting Hutus combatants of the FDLR. All military operations will now fall under the command of the government’s 8th military region in North Kivu province and the 10th in South Kivu. What this means for the infamously ill-disciplined Congolese army is still unclear. One theory is that ending the Amani Leo operations could take many of the rebel fighters (ex-CNDP, PARECO) now integrated in the army, who play a prominent role in the Amani Leo operations, off of the battlefield. But what Kabila gains in this scenario isn’t immediately apparent, and as blogger Jason Stearns in Goma pointed out, some army officers “are worried that the malcontents may stir up trouble.” Another tactic heard from Enough sources in Goma is President Kabila is planning to restructure the Congolese army into four Defense Zones, with primary bases of operations in Kinshasa, Lubumbashi, Equateur, and Kisangani. While the Congolese government vows justice through military tribunals for the mutineers, the fate of Bosco Ntaganda is a matter of intense talks. On April 8, ahead of Kabila’s own visit, the president sent Kalev Mutond, the trusted head of ANR, the national intelligence agency, to meet with senior Rwandan officials and army officers. According to Enough Project sources, the ongoing discussions are focused on the March 2009 peace agreement forged to officially end the rebel CNDP’s armed insurrection, which was backed by Rwanda, and integrate the rebels into the army under some strict expectations about where they would deploy, among other conditions. But how will Ntaganda fare at the end of talks between Congolese and Rwandan officials? At this stage, several outcomes look possible, and it’s difficult to say which is most likely, especially in light of Congo and Rwanda’s last big, secret compromise on the CNDP, which led to the surprise arrest of former CNDP leader Laurent Nkunda and set up the present arrangements that gave Ntaganda so much power. Any of the outcomes will have important ripple effects in eastern Congo and perhaps the wider Great Lakes region, so they’re worth considering ahead of time. Arresting Bosco: Following Congo’s fraudulent elections late last year, President Kabila has come under intense international pressure and increasing domestic pressure to arrest Ntaganda, who is wanted by the International Criminal Court for war crimes. In a stunning about-face after claiming that Ntaganda is essential for peace in the Kivus, Kabila indicated yesterday that he would arrest Ntaganda but made a point of saying that his approach is not a result of international pressure. "We have over a hundred reasons for arresting and prosecuting him here and if not here [in Goma], then it could be anywhere else, including in Kinshasa. That said we are not short of reasons [to arrest him],” Kabila said. The army Chief of Staff Didier Etumba, who traveled to Goma to join in the talks with Rwanda, sounded an unequivocal note: "Someone who refuses to be patriotic cannot serve under the flag,” Etumba said. “And when this happens, when they take up arms, well, they must be hunted and neutralized and those who have legal problems will have to answer for them.” Helping deliver Ntaganda to The Hague to stand trial for his alleged crimes would earn Kabila praise for (finally) cracking down on impunity. Of course, without a swift apprehension, Ntaganda will likely try to evade capture by drawing from his significant fortune, amassed largely through his dealings in conflict minerals, to convince fighters to stick by his side. The rebellion they could mount would likely lead to widespread insecurity before a “victory for the ICC” could be declared. Killing Bosco: For the Rwandans, letting their occasional ally Bosco Ntaganda take the stand in The Hague and lay bare their shadowy partnership and dealings in Congo’s smuggled conflict minerals may be reason enough to orchestrate or at least give Congo their blessing to kill Ntaganda. The Rwandan government may calculate that it is in their interest to prioritize its relationship with Kinshasa over continuing to protect Ntaganda, who for Kigali as well has become an object of international criticism. Of course, any actions against Ntaganda apart from a negotiated settlement (see below) that force Ntaganda to ensconce himself in his renewed rebellion will in the meantime have a devastating impact on communities in the crossfire. Letting Bosco “retire”: Ntanganda’s whereabouts remain unknown. However, he might be forced to step down from his military exploits and retire to his farming land in Masisi, according to an ex-CNDP loyalist colonel who attended recent meetings with senior government officials in Goma. Despite clear calls by the international community to arrest Bosco and transfer him to the International Criminal Court, there is no clear indication that the Congolese government will comply. Meanwhile, it seems that talks with Rwanda and Kabila’s bold engagement have started to influence the calculations of the soldiers that mutinied alongside Ntaganda last week. 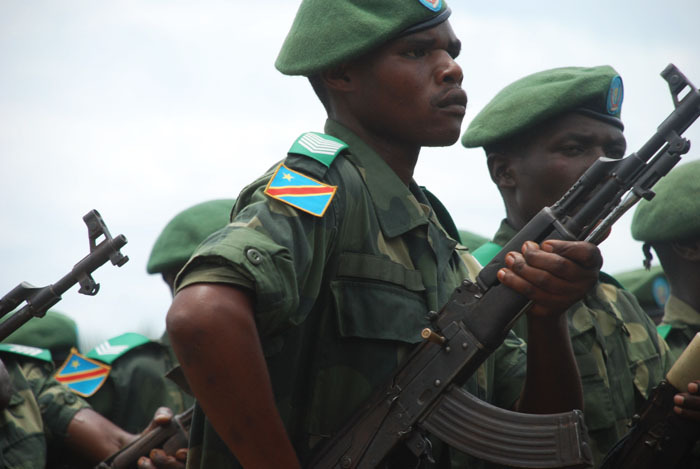 In Uvira, South Kivu, 128 defecting soldiers have reportedly returned to their base with their commanders. In Bunagana, north of Goma, 200 soldiers have reportedly turned themselves in so far. The Ugandan army reportedly captured nine mutinous senior officers Col. Innocent Kayina, who had fled to Uganda under FARDC pressure. As the tense situation continues to unfold, Congo advocates should seize the opportunity of this uncertain time to utilize all possible leverages, including cutting funding unaccountable institutions, to oblige Joseph Kabila to deliver meaningful reforms to the Congolese security sector—a need rarely seen as more urgent than now.